Cooked goose sausage - OCA SFORZESCA S.r.l. It is a cooked goose sausage without pork meat added. It is a gourmet, light, sweet-smelling, traditional, ready to eat product. ready to eat because it is cooked vacuum-packed at low temperature for many hours. 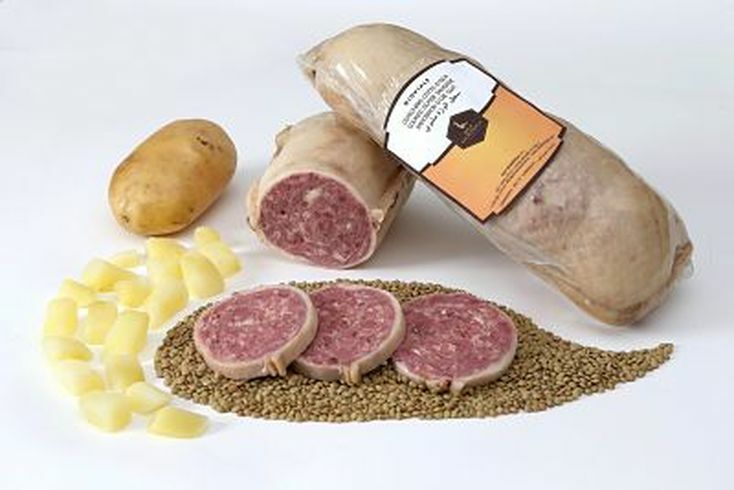 This local high quality goose product is made with the beef case stuffed with its fresh goose meat and goose fat. All the goose meat is minced and the other ingredients are then added (flavourings, spices and Cervia's sea salt). Then it is vacuum-packed and cooked at low temperature for many hours. At the end of the cooking process, the goose cotechino is immediately refrigerated to reach the right moisture balance and keep its intense taste. Cotechino is ready to eat. You can warm it into microwave, hot water or traditional oven. It is should be eaten warm in thick slices as a second course accompanied by potatoes, lentils or onions. It is free of allergens (gluten, lactose, celery, nuts etc.). It must be kept at 0/+4°C. It comes in 1,0 kg packaging. Packed under vacuum in two pieces. Shelf life whole piece 90 days.